1. Divide the number of advancing issues by the number of unchanged issues. 2. Divide the number of declining issues by the number of unchanged issues. 3. Subtract the declining ratio from the advancing ratio. 4. Calculate the square root of the difference. 5. Add the square root to the previous day’s Bolton-Temblay Indicator, respecting the sign (+ is there were more advances and – if there were more declines). On the other hand, if there had been 700 advancing issues and 1500 declining, today’s Bolton-Tremblay Indicator equals yesterday’s value minus 1. 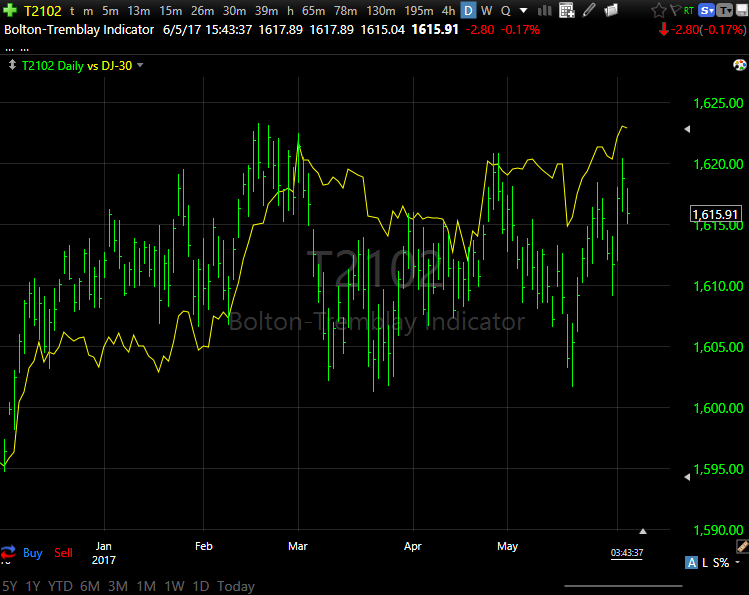 The Bolton-Tremblay Indicator should be interpreted in a manner similar to the advance-decline line. In fact, if you plot a comparison graph using T2100 as the comparison symbol, the two graphs are almost identical. Keep in mind that the actual value of the indicator is far less important than its trend.